Video content is one of the most resource-intensive kinds of content you can create. Done well, it requires expensive equipment and time investment both before, during, and after shooting. The result is often very appealing and, as we can see with sites like YouTube, intrinsically social. Yet, more often than not, it can be the video hosting service that earns a link, and not your site. 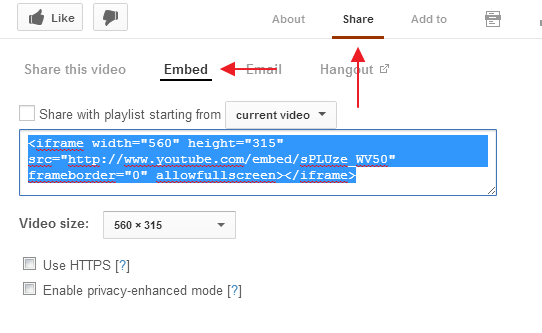 Short of hosting the video on your own site, here are a few simple steps you can take to earn a few extra links. A simple way to do this is by creating a blog post about the video. Add some content before and after it (more on that in a bit), and embed it centrally in the page. Set the video to ‘Unlisted’ for a week or so – this way, Google will index the video as part of your site before it indexes it in YouTube, increasing the likelihood that it will use your page with the video as a video result in search. Make sure to optimize whatever written content you add as well as the page itself. Manually edit that pages’ metadata to indicate that the item being shared is a video, and point the video’s location back at the place your hosting that file. This will make the video show up in the shorthand version shared on different social networks, meaning it’ll be just as engaging as a shared link directly to a YouTube video and the click through will take them to your site. For example, by adding “meta property=”og:video” content=”http://youtube.com/fakevideoid/”” and “meta property=”og:video:type” content=”application/x-shockwave-flash”” to the page you’ve hosted the video on, Facebook will show a video link preview and allow users to play the video right in their feed. For a more thorough walkthrough of this particular example, see Emeric Ernoult‘s excellent Social Media Examiner post on how to do this. You can apply a similar methodology for Twitters Cards metadata, but the service hasn’t rolled out the Cards system to all sites, so it won’t take effect for awhile. This is pretty straightforward – make sure that anywhere you share the video, you point the click through URL back to the page on which you originally hosted the video. 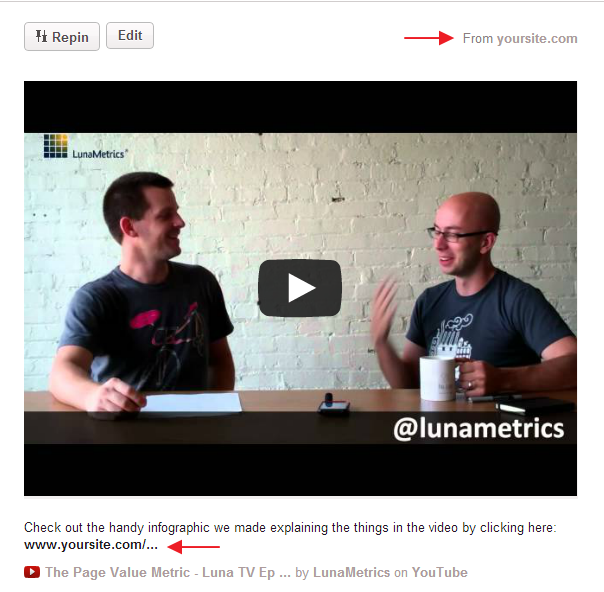 For example, on Pinterest, you can edit the URL of the video after you pin it by clicking the edit button on the pin. This changes the ‘From’ link to the page you have the video on. You can also add a link to the video in the description – this increases the likelihood that someone will follow the link to your post, and not YouTube, thusly increasing the likelihood of them linking to your page and not your video. Don’t forget those CTAs! Create some thoughtful content tangential to the video, and mention it in the video description and social meta descriptions to provide incentive for someone viewing the video to click through and visit your site. This increases the likelihood that they’ll see and use your handily provided embed code. 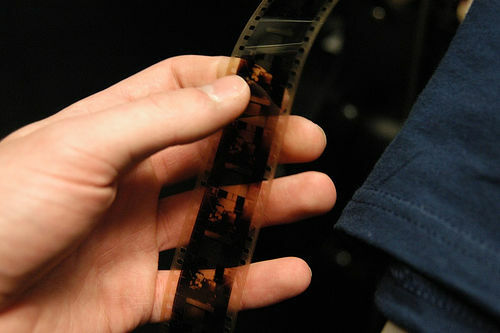 It also provides additional reason for them to share your page, and not just the video itself. Got any tips or tricks that you use to increase the links you earn with your video content? Let us know in the comments!